Every wonder where those Peeps Marshmallow Chicks come from? Well it all starts with a mini marshmallow snuggled in a chocolate peanut butter chia seed pretzel nest. 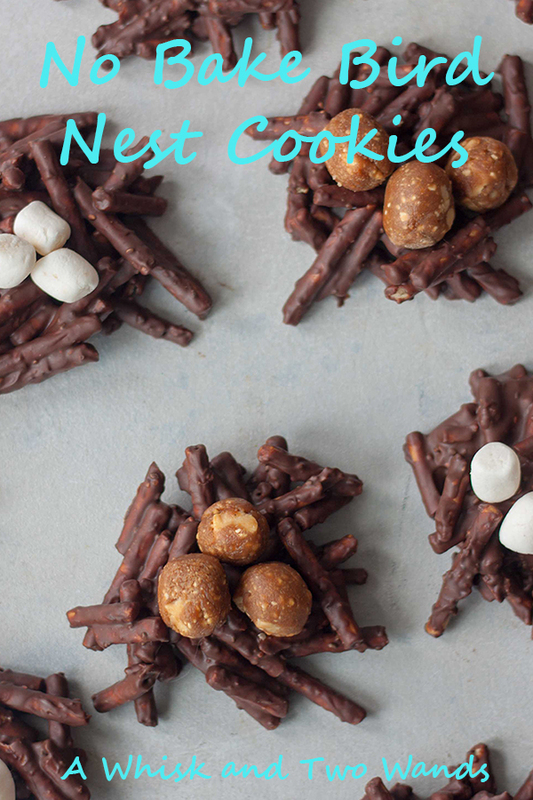 Ok not really but that’s my explanation for these No Bake Bird Nest Cookies! An upgrade on a childhood classic that my mom use to make. You know the chocolate covered Chinese noodles with jelly beans? Well since we love pretzels, chocolate, peanut butter, and marshmallows and I’m not a huge fan of Chinese noodles or jellybeans. Despite getting sucked in a few years (like last year making those dang flavor combos with the family pairing different flavors) and having a couple jellybeans which often leads to a few more (hello sugar) and leaves me with a tummy ache. I didn’t even buy any this year, we’ll leave that to grandma or maybe I’ll give in since the hubby requested them, back to these cookies. Quick and easy no bake cookies that the kids can help you make for Easter, or just a spring treat. 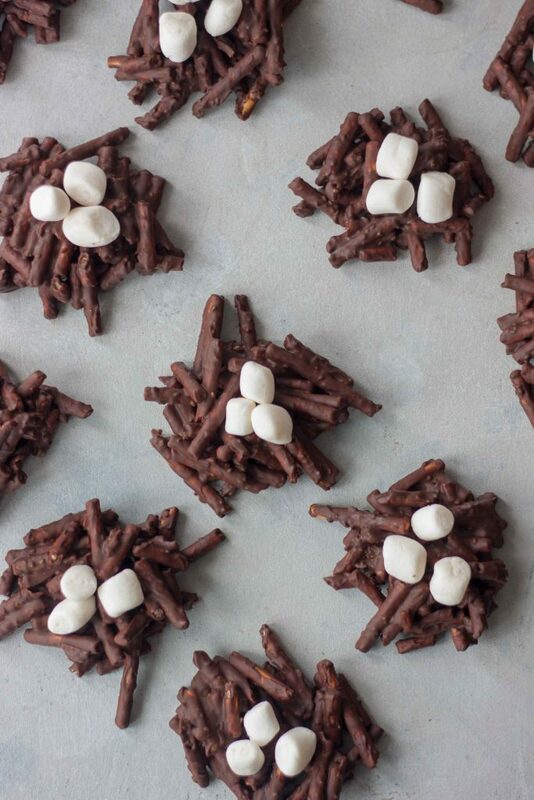 Come summer you can just call them Campfire Cookies, what we’ll be doing, and we’ll be trying to toast those marshmallows. All you have to do is break pretzels, this is a fun job for smaller hands, just make sure they don’t crush them. Heat a little chocolate and peanut butter together, stir in the pretzels, add an optional tablespoon of chia seeds (yes an easy way to add in a little healthy superfood boost of healthy fats, omegas, and fiber), and drop spoonfuls on a parchment paper lined baking sheet. Add a couple marshmallows and ta-da! Now if you aren’t a huge marshmallow fan you can add something else like I did for a few. I chopped up a couple GoMacro Bars, warmed for 10 seconds, and rolled into “eggs”. If you are a marshmallow fan, and a fan of those Peeps. You can even have a little fun with the family. Yeah my husband likes those darn marshmallow Peeps and my mom always buys them, and extras to “roast” in the summer. I don’t wait for summer I went to make an angel food cake with them years ago and started them on fire in my mom’s oven. But hey that’s because I dislike them and is a whole other story. You can make these with the kids and add or swap out a Peep. As much as I’m not a fan I did by the family just 1 package of Peep Oreos this year to take to grandma and grandpa’s. All about balance and I think of it like I do St. Patrick’s Day when I have to buy a box of Lucky Charms. I only bought them each a chocolate bunny and the package of Peep Oreos for Easter candy…. would it be wrong if I forgot to get the Peeps and jellybeans the hubby requested? I always try to make some healthier treats for the get togethers that everyone will still enjoy. They can grab these and yes there is still chocolate and marshmallows but they satisfy that chocolate peanut butter craving A and I LOVE and they are more filling and satisfying without just handfuls of candy that leave you empty and wanting more. Again, still, whatever craving coconut and since I first made my Vanilla Bean Coconut Butter Almond Butter Cups for Easter 4 years ago. 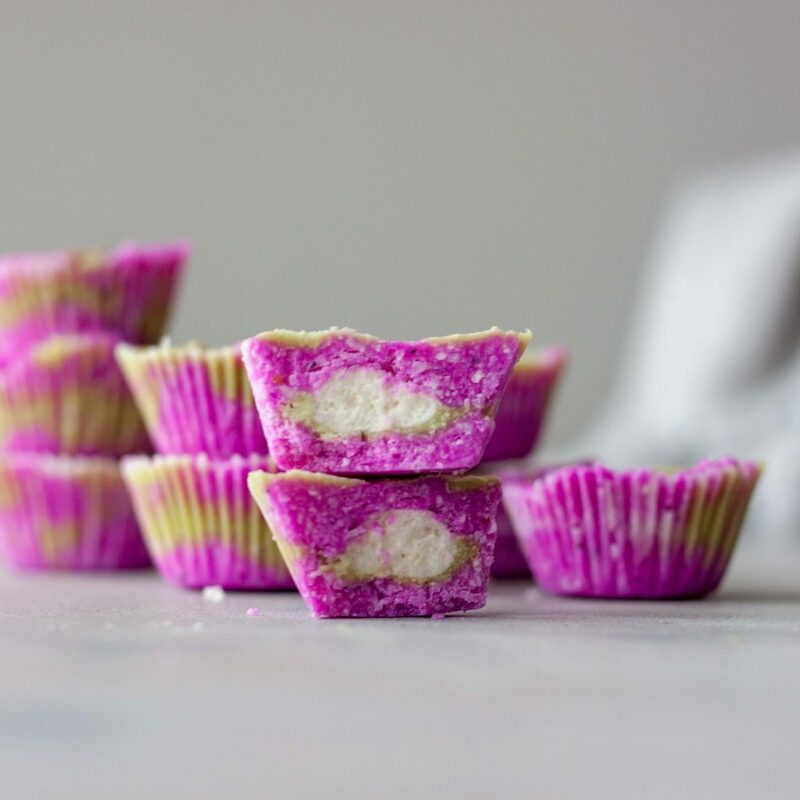 Recently updating to my Pitaya Coconut Peanut Butter Cups. Not to mention the Matcha Chocolate Nut Butter Coconut Cups and Matcha Marshmallow Coconut Cups that I still haven’t posted and realized again earlier this week. I’ve responded to those asking for the recipe and will get it posted next week in plenty of time for Easter. If you need the details message me, otherwise plan for it to be posted next Wednesday and if you need to know what to purchase for planning the ingredients are listed in the Pitaya Coconut Peanut Butter Cups post (which has the instructions) and the Matcha Marshmallow Coconut Cups and Matcha Chocolate Nut Butter Coconut Cups I posted on Instagram. Same instructions just slight changes in ingredients weather you add pitaya or matcha and fill them with a nut butter or marshmallows. Here’s a little sneak of the combination I’ll be mentioning next week when posting the matcha ones. You may have seen a sneak of these No Bake Bird Next Cookies on Instagram yesterday and I’m sad to report none of the survived yesterday’s spring snowstorm, the family at them ALL! Yep after school, after soccer, they had no chance. I’ll be whipping up a double batch for Easter! Our of curiosity (clearly no judgement here) are you team Peeps? What would be your one Easter candy must have? As mentioned not for me but growing up I had a thing for Cadbury Cream Eggs but the last time I had one, years it wasn’t as good as I remembered which was a disappointment. I love all things peanut butter and chocolate but trying to think of an Easter candy I want I’m coming up blank. When I asked the girls what one thing they wanted and both said a chocolate bunny. My husband couldn’t keep it to one and wants jellybeans (specific ones not just any, and no BLACK ones), robin eggs, chocolate marshmallow eggs, and Peeps. 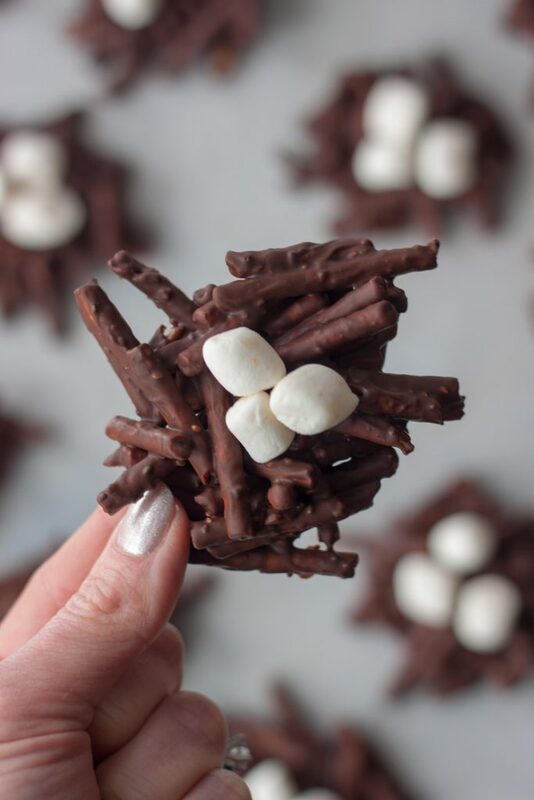 Fun twist on classic No Bake Bird Nest Cookies making them with chocolate, peanut butter, pretzels, adding a little healthy nutrition with chia seeds, and topping with marshmallows! These Easter, or springtime, cookies are vegan and allergen friendly. Break pretzels into pieces, no particular size you just don't want them to be crushed or whole. Set pretzels aside. In a large bowl combine chocolate chips and peanut butter. Heat in the microwave for 1-2 minutes, stirring every 30 seconds until melted and smooth. 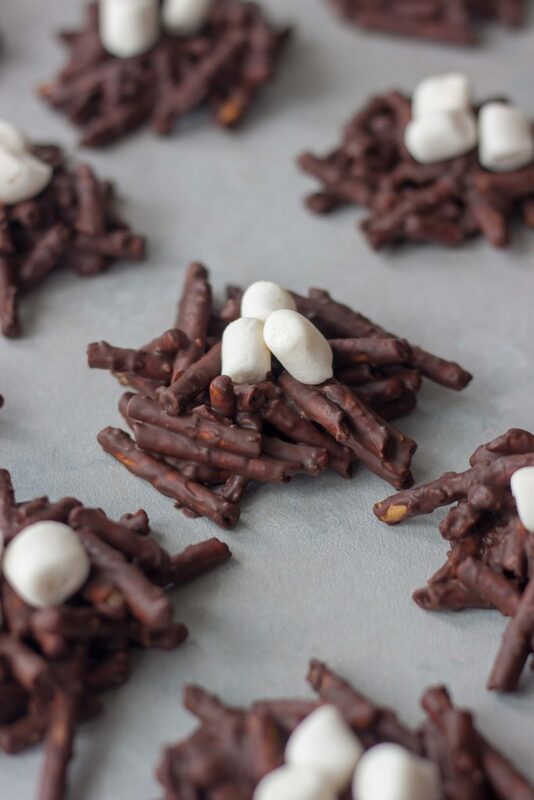 Add pretzels to the melted chocolate mixture and stir gently to coat. Sprinkle in chia seeds and fold. Using a tablespoon (not measuring spoon) drop spoonfuls onto prepared baking sheets. You can gently push down the middle if needed so they aren't flat. 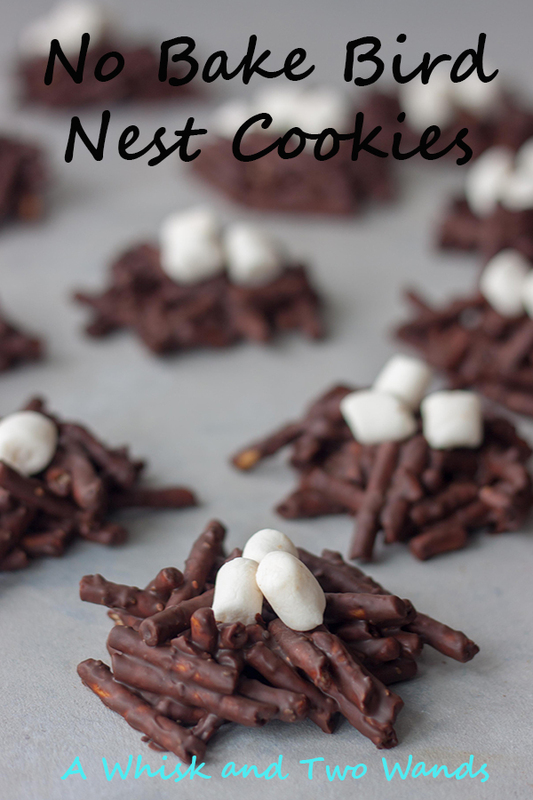 Continue until all of your nests are made and immediately top with marshmallows or other "eggs" of choice. By ingredients these cookies are dairy free, egg free, and gluten free. To make nut free sub seed butter or coconut oil instead of peanut butter. To make vegan sub another pretzel as the ones used do contain honey. I also used GoMacro Bars for "eggs" in some of these cookies. Just chop bar into about 12 pieces, warm in the microwave for 10 seconds, and roll into balls. Have them ready before making cookies so they can be added before the chocolate has set. Feel free to sub another candy for eggs to top your cookies. Deborah @ Confessions of mother runner recently posted…I’m Never Running A Marathon-Am I Still A Real Runner? These are so cute and they look so good! Perfect for Easter for sure! These are so fun and cute for Easter! 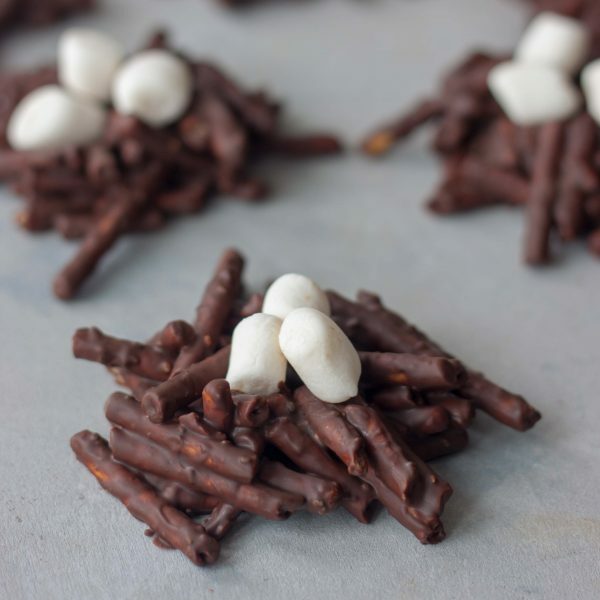 Kids will have a great time making these easy no bake treats! I’m not really too interested in baking, so these are perfect for me! Love the sweet and salty mix. That always makes the best treat! Adorable! And I can tell from the ingredients that they taste delicious. These are so cute and perfect for Easter! Totally going to have to make these for Easter brunch. They look delicious!